Keywords: Flexural strength, mechanical properties, Pinus elliottii, thermal stability, wood flour. acid increased by 14°C when compared with wood plastic composites without coupling agent, while addition of polypropylene grafted with maleic anhydride increased approximately 6°C the composite thermal stability. A morphological study revealed the positive effect of the polypropylene grafted with itaconic acid on the interfacial bonding of recycled polypropylene and wood flour. Adhikary, K.B. ; Pang, S.; Staiger, M.P.2008. Dimensional stability and mechanical behaviour of wood-plastic composites based on recycled and virgin high-density polyethylene (HDPE). Composites Part B 39: 807-815. Araújo, J.R.; Waldman, W.R.; De Paoli, M.A. 2008. Thermal properties of high density polyethylene composites with natural fibers: coupling agent effect. Polymer Degradation and Stability 93: 1770-1775. Bruna, J.; Yazdani-Pedram, M.; Quijada, R. Valentín, J.L. ; López- Manchado, M.A. 2005. Melt grafting of itaconic acid and its derivatives onto an ethylene-propylene copolymer. Reactive & Functional Polymers 64: 169-178. Cui, Y.; Lee, S.; Noruziaan, B.; Cheung, M.; Tao, J. 2008. Fabrication and interfacial modification of wood/recycled plastic composite materials. Composites Part A 39: 655-661. Dányádi, L.; Móczó, J.; Pukánszky, B. 2010. Effect of various surface modifications of wood flour on the properties of PP/wood composites. Composites Part A 41: 199-206. El-Sabbagh, A. 2014. Effect of coupling agent on natural fibre/polypropylene composites on mechanical and thermal behaviour. Composites Part B 57: 126-135. Fabiyi, J.S. ; McDonald, A.G. 2014. Degradation of polypropylene in naturally and artificially weathered plastic matrix composites. Maderas-Cienc Tecnol 16: 275-290. Gallagher, L.W. ; McDonald, A.G. 2013. The effect of micron sized fibers in wood plastic composites. Maderas-Cienc Tecnol 15: 357-374. Habibi, Y.; El-Zawawy, W.K. ; Ibrahim, M.M. ; Dufresne, A. 2008. Processing and characterization of reinforced polyethylene composites made with lignocellulosic fibers from Egyptian agro-industrial residues. Composites Science and Technology 68: 1877-1885. Khonsari, A.; Taghiyari, H.R. ; Karimi, A.; Tajvidi, M. 2015. Study on the effect of wood flour geometry on physical and mechanical properties of wood-plastic composites. Maderas-Cienc Tecnol 17: 545-558. Kim, H.S. ; Lee, B.H. ; Choi, S.W. ; Kim, S.; Kim, H.J. 2007. The effect of types of maleic anhydride-grafted polypropylene (MAPP) on the interfacial adhesion properties of bio-flour-filled polypropylene composites. Composites Part A 38: 1473-1482. Moncada, E.; Quijada, R.; Lieberwirth, I.; Yazdani-Pedram, M. 2006. Use of PP grafted with itacoic acid as a new compatibilizer for PP/clay nanocomposites. Macromolecular Chemistry and Physics 207: 1376-1386. Nachtigall, S.M.B. ; Cerveira, G.S. ; Rosa, S.M.L. 2007. New polymeric-coupling agent for polypropylene/wood-flour composites. Polymer Testing 26: 619-628. Nygård, P.; Tanem, B.S. ; Karlsen, T.; Brachet, P.; Leinsvang, B. 2008. Extrusion-based wood fibre-PP composites: wood powder and pelletized wood fibres- a comparative study. 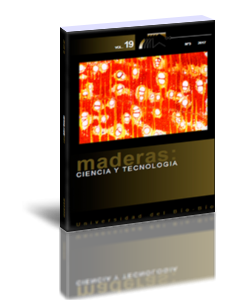 Composites Science and Technology 68: 3418-3424. Palza, H.; Vergara, R.; Yazdani-Pedram, M.; Quijada, R. 2009. Polypropylene/clay nanocomposites: effect of different clays and compatibilizers on their morphology. Journal of Applied Polymer Science 112: 1278-1286. Poletto, M.; Zeni, M.; Zattera, A.J. 2012. Effects of wood flour addition and coupling agent content on mechanical properties of recycled polystyrene/wood flour composites. Journal of Thermoplastic Composite Materials 25: 821-833. Poletto, M.; Zattera, A.J. ; Santana, R.M.C. 2014. Effect of natural oils on the stability and degradation kinetics of recycled polypropylene wood flour composites. Polymer Composites 10: 1935- 1942. Rosa, S.M.L. ; Santos, E.F.; Ferreira, C.A. ; Nachtigall, S.M.B. 2009. Studies on the properties of rice-husk-filled-PP composites - effect of maleated PP. Materials Research 12: 333-338. Rose, M.; Palkovits, R. 2011. Cellulose-based sustainable polymers: state of the art and future trends. Macromolecular Rapid Communications 32: 1299-1311. Sailaja, R.R.N. ; Seetharamu, S. 2008. Itaconic acid-grafed LDPE as compatibilizer for LDPE-plasticized Tapioca starch blends. Reactive & Functional Polymers 68: 831-841. Toro, P.; Quijada, R.; Peralta, R.; Yazdani-Pedram, M. 2007. Influence of grafted polypropylene on the mechanical properties of mineral-filled polypropylene composites. Journal of Applied Polymer Science 103: 2343-2350. Willke, T.; Vorlop, K.D. 2001. Biotechnological production of itaconic acid. Applied Microbiology and Biotechnology 56: 289-295.